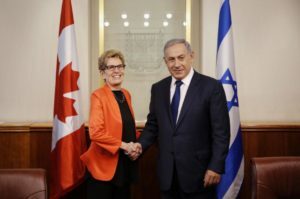 Ontario Premier Kathleen Wynne has maintained strong relations with the widely reviled government of Israeli Prime Minister Benjamin Netanyahu. Toronto, Ontario— Independent Jewish Voices Canada (IJV) is deeply concerned and disturbed by the passage of the private members motion 36 against the Boycott, Divestment and Sanctions (BDS) movement. The motion passed despite opposition from the Ontario New Democratic Party (ONDP). “It is outrageous for our elected representatives to publicly chastise human rights supporters, and falsely accuse them of hatred and bigotry for standing in solidarity with the victims of Israeli state violence and oppression. The so-called debate in the Ontario Legislature was little more than a slurry of lies and defamation against Palestinian human rights advocates,” says IJV spokesperson Tyler Levitan. Several civil society organizations expressed their opposition to the motion, including CUPE Ontario, the Ontario Civil Liberties Association, the Israeli organization Boycott from Within and dozens of other groups.